story by Jacob HellmanCity Hall—now a crisp white icon, but it was only last year that the building’s restoration was finally finished, undoing a half-century of neglect. Built with some 88 million bricks, the restoration treated 200,000 square feet of masonry, 680 windows and 250 sculptures. The project drew on an army of building conservation specialists, and employed some of the industry’s most advanced techniques. It’s no wonder the process took a decade. Modern conservation is a science, but it often must begin from a position of ignorance: old materials are simply unpredictable. City Hall’s tower is made from white Massachusetts Lee marble. 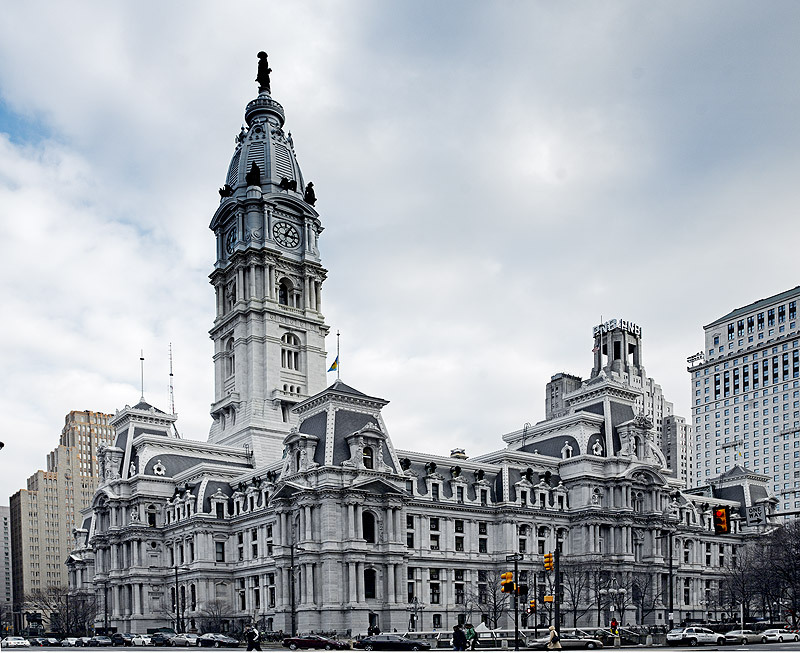 But the building’s 30-year construction period was during the coal-burning era and when finished, City Hall was covered in soot and appeared gray. Press accounts even described it as limestone. To determine the appropriate cleaning technique the masonry restoration contractor tested inconspicuous spots to learn what worked, what didn’t and what might damage the stone. Ultimately, explains Nan Gutterman, who works for Vitetta, the architecture firm that oversaw the project, they settled on a “low-pressure micro-abrasive system at 25 to 35 psi”—colloquially known as sandblasting. While the tower’s bronze sculptures can’t be seen without scaffolding, they’ve also been restored to original detail from patina-encrusted oblivion. In the hundred years since they left Alexander Milne Calder’s studio, micro-crevices in the metal’s surface collected impurities and hastened freeze-thaw cycle deterioration. Here, the Polish-trained conservator Andrzej Dajnowski imported a German laser technology never used on this scale. The laser’s beam not only vaporizes dirt, but re-melts a thin surface layer of the metal, eliminating the pitting from the casting process and making it literally better than new. Sturm is finishing his master’s thesis on a defunct brick manufactory, and explains that the only significant innovation to hit the world of bricks involves the way they’re fired. Kilns were once highly unpredictable; cold spots produced under-fired bricks that eventually crumble. Around the middle of the 20th century, ceramic engineers developed modern tunnel kilns, which put out denser and more robust bricks. Even with old brick, though, conservation is largely a matter of keeping roof and gutter leaks from washing out mortar, and an occasional re-pointing. If you’ve got an old rowhouse, avoid Portland cement-based mortar. Mortar is intended to be a sacrificial buffer, but Portland is less permeable than historic lime-based mortars and doesn’t allow water to pass. Instead, water is forced through the brick, which will eventually deteriorate.